These easy peasy oatmeal-peanut butter bars can be made in a jiffy and are great for snacking. I followed this recipe for these yummy bars and all good, healthy things can be sneaked in these bars. * Place peanut butter, chocolate chips, brown sugar and vanilla in a microwave safe bowl and microwave the mixture until it melts. * Remove and add the oats, coconut and walnuts. The resulting mixture should be fairly dry. * Mix well and pat the mixture into a greased, square pan. 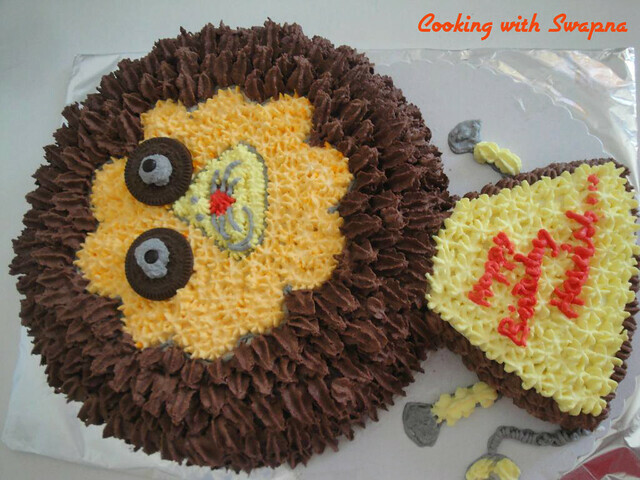 * Freeze or refrigerate until firm and then cut into pieces. After a little hiatus, I am back with another edition of Srivalli's blogging marathon. Yes, it's BM# 16 time and my posts this week are going to be "Pick one - Cook all" theme based and my ingredient choice is oats. My first oats post is going to be these yummy muffins that are regular at my home. They are perfect for breakfast or snacking. This recipe particularly comes handy when those overripe bananas need to be put for good use. You can keep the recipe basic without the addition of nuts / dry fruits but I recommend them since they definitely enhance the flavor and make these muffins special. * Preheat oven to 375 deg F / 190 deg C.
* Combine the flours, baking soda, baking powder, salt, coconut flakes and raisins in a bowl. * Mash bananas in another bowl. Add sugar and mix well. Stir in melted butter. Then stir in dry ingredients. * Grease or line the muffin pan with paper cups. Spoon the batter into cups so that it fills up to 3/4th of each cup. Sprinkle walnuts. 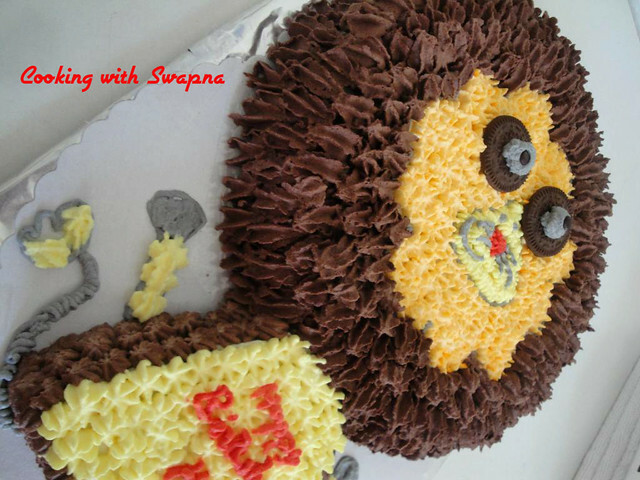 * Bake until a toothpick inserted at center comes out clean or for about 25 - 30 minutes. 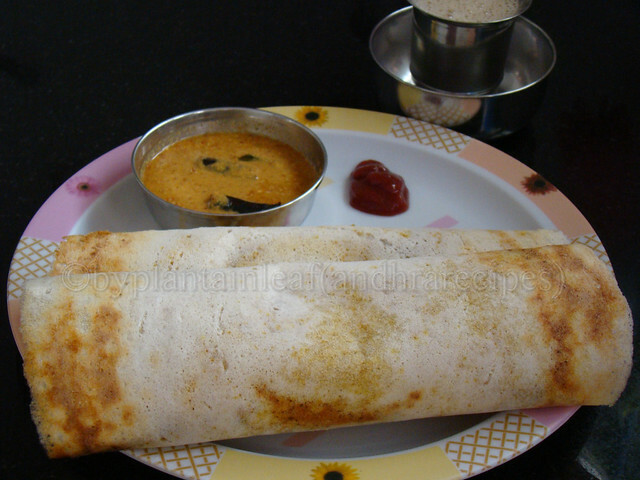 Masala dosa is one of the most favorite breakfast in South India. Of course it's my favorite breakfast too. Normally what we make for masala dosa stuffing is a potato curry. But now a days there are many varieties of stuffing's we are using to give a twist to traditional masala dosa. Normally i make aloo and cabbage curry with garam masala for roties. Yestarday i made this curry with chat masala that gives a different taste to the curry. when i had this curry with my dosas i liked the combination. That time i got this idea of making this curry as a filling for dosas. Today morning again i made this curry and used as masala dosa stuffing. So that this cabbage and aloo masal dosa with chat masala was born. 1. Heat oil in a pan add mustrd seeds let them popup then add urad dal, cumin seeds, curry leaves let them also popup then add potato cubes sprinkle little salt and water cover and cook in a very low heat till potatoes are half cooked. 2. Add chopped cabbage, turmeric powder and salt to taste give good stir and sprinkle some more water cover and cook in a very low heat for 8 minutes, stir in between. 3. After ten minutes open the lid and mix well, check if the vegetables are cooked or not, if not sprinkle some more water again cover and cook for 5 minutes more. 4. Open the lid add red chili powder, chat masala mix well and remove from heat. 5. Heat a dosa pan or a skillet clean with a kitchen towel, Pour a ladle full of dosa batter in the center of the pan. spread the batter with back of the ladle in to a thin circle. 6. Drizzle oil along the edges of the dosa and let it cook in a low heat till dosa turns in to golden. 7. Keep two tab sp of cabbage potato curry in middle of the dosa mash little with help of the back side of the spoon and spread the curry all over the dosa. 8. Now fold dosa like a roll remove from heat and serve. Another interesting way of incorporating oats in an Indian kitchen and thanks to Priya Suresh. This wonderful idea of adding oats to a spice powder came from her, who had posted another version during last marathon. It sounded so interesting that I tried it last week and nobody could point out the difference between the regular chutney powder and this oats one. 1/4 cup oats (I used quick oats). * Toast chana dal and urad dal in a pan on medium flame until they start to change the color. Transfer them to a plate and let them cool. Add oats and red chillies to the same pan and toast for a minute. Let them cool as well. Dry toast curry leaves and keep them aside. * Now add all the ingredients to a grinder / blender and grind the mixture to the desired consistency. I usually prefer a coarse powder. * Store it in airtight container and use it as a side dish for breakfast items like dosa, idli, rice or with plain rice and ghee. Making Dosa is a common thing in every South Indian house. 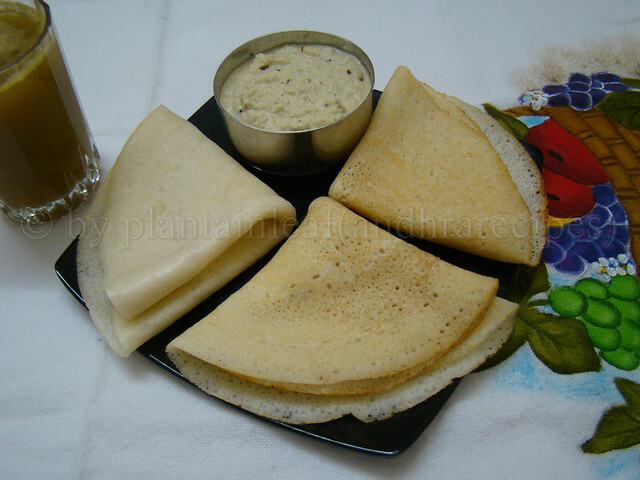 there are many varieties of dosas with different flours and flavors. Normaly in Tamilnadu and Karnataka people use par boiled rice to make dosas. This parboiled rice give a fluffy texture to dosa and when you spread this batter very thin these dosas will turn in to very crisp. In Andhra pradesh we use raw rice to make dosas. With this raw rice dosas won't turn that much crisp like parboiled rice dosas. You can make soft dosas with this raw rice batter. Normally we soak rice and urad dal 1:2 proportion for 6 hours then grind in to a smooth paste. 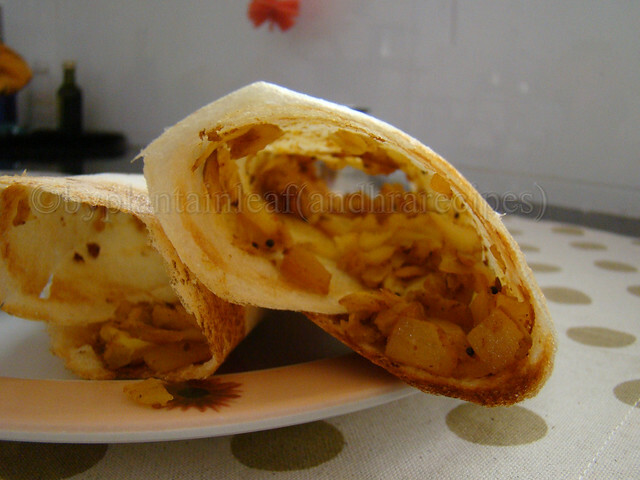 Here my grandmother (nanamma, fathers mother) and my mom makes this dosas little different way. They soak the raw rice for 24 hours then drain all the water and pound that wet rice in a stone pestle (rolu) in to a fine powder and mix this rice powder to urad dal paste. Believe me these dosa turn soft and more delicious then what regularly I make. In my childhood there are no gas stoves my GM used to make this dosas on a kerosene stove. She starts making them 7o clock in the morning and she ends up at 10 o clock in the morning. Now amma is making with the same recipe. Last month when I was there in ammas place, she made this dosas for me with coconut chutney. Here you go with the recipe..
1. Soak rice for 24 hours, drain all the water and pound in a stone pestle or a dry mixer or in a dry blender in to a fine powder. Remove in to a big bowl and cover and set a side. 2. Soak urad dal in water for 3 hours and grind in to a smooth paste. 3. Now take 3 cups of raw rice flour in a big mixing bowl. 4. Add salt to taste and 2 cups of water and make a paste like fitter batter consistency. 5. Add urad dal paste to this raw rice flour paste mix well to combine to gather. 6. Set a side to ferment for over night. 7. Next day morning heat a skillet or a dosa pan, pour 1 ladle full dasa batter and spread this batter in to circle, drizzle little oil along the edges and let it cook for 1 minute. 8. Then flip the dosa other side and cook for a while. 9. You can make this dosas as thin as you want and if you make them little thick they turn out soft dosas. Adais are healthy, quick alternative to the regular dosas and also the short soaking period and no fermentation makes them suitable during time crunches. Adais can be prepared immediately after grinding or the batter can be refrigerated until use. Replacing the rice with oats make them more healthier and they do taste exactly the same as the regualr rice version adais. * Wash and soak dals together in water for a couple of hours or in hot water for an hour. Throw away the water after the soaking period. * Add all the ingredients except onion to a blender. Add sufficient water and grind into a thick, coarse batter. The batter should not be runny. * Next add the minced onion to the ground batter and mix well. * Heat a tawa / iron griddle. When it is hot enough, pour a ladleful of batter at the center and spread it into a circle. Pour 1/2 tsp oil around the edges and cook for about a minute on medium flame. When it appears done on the bottom side, flip the adai. Pour another 1/2 tsp oil around the edges. Cook for another 30 seconds and remove the adai. * Repeat the procedure with the remaining batter. 1. Peel the root, clean and dry completely. It's little slimey. 2. Cut into thick rounds. 3. Sprinkle salt, chili powder, asafoetida and turmeric powder. 4. Dredge into rice flour and rawa mixture. 5. Heat a tawa or pan. 6. Shallow fry on both sides adding oil as necessary. 7. Drain on a kitchen napkin before serving. 1. You can add little chili powder, salt in the rice flour mixture to give an extra taste. 2. Any root vegetables like potato, yam, sweet potato or even eggplants, raw tomatoes, bitter gourd, breadfruit , mushrooms can be used for making these fritters. * Toast the oats on medium flame until you start to smell the aroma. (This step is optional and I skip it sometimes). Turn off the stove and let cool. * Add the toasted oats, walnuts, coconut and jaggery to a food processor / blender and process until the mixture comes together. * Remove the mixture from the processor. Take a fistful mixture at a time and shape it into laddus/small balls. What is "Kolhapuri" in the good, old koshimbeer - you might ask? Well, I agree - Koshimbeer is a koshimbeer after all. But over the years, I have collected so many recipes from friends and family, that I use my own prefixes and suffixes to differentiate. Now, when we make Koshimbeer, we don't add chili powder in it - so that's one factor which stands out in today's recipe. 1. Prepare the veggies by peeling/chopping/grating. 2. Mix all veggies together. 3. Add salt, chaat masala, chili powder. 1. Chaat masala has rock salt so adjust salt accordingly. 2. Instead of yellow corn, freshly shelled green peas can also be used. 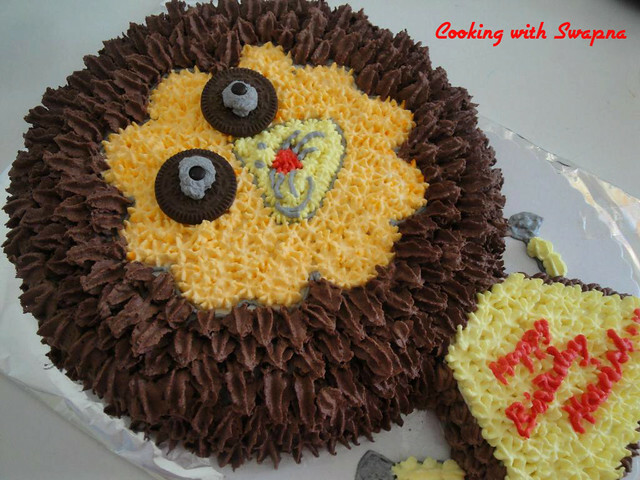 This cake is as simple and quick to prepare as it is delicious to eat. 1. Preheat the oven to 180 C. Lightly grease and flour a baking pan. 2. Combine the flour, cocoa, baking powder, cinnamon and salt in a medium bowl. Beat the butter, sugar and vanilla until creamy. 3. Add the eggs one a time, beating until just blended. Gradually beat in the dry ingredients. Stir in the pineapple and walnuts by hand. Spoon the batter into the prepared pan. 4. Bake for 35 - 45 mins. 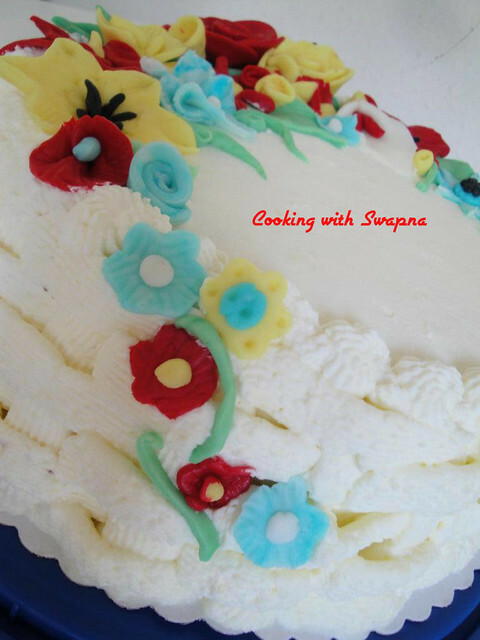 Cool the cake completely and decorate it with the whipped cream frosting. Pound cake is named for the fact that traditionally it was made with a pound each of butter, sugar, eggs and flour, with spices or nuts and seeds added for flavor. Originally baking powder was not used and the leavening was provided by the eggs. Nowadays we use baking powder and sometimes baking soda for reliable, easy leavening. 2. Combine the flour, baking powder, baking soda and salt. Beat the butter, sugar, vanilla and almond extracts in a large bowl until pale and creamy. 3. Add the eggs one at a time, beating until just blended after each addition. With mixer at low speed, gradually beat in the dry ingredients, alternating with the milk. Spoon the batter into the prepared pan. 4. Bake for 50 - 60 mins or until a toothpick inserted into the center comes out clean. 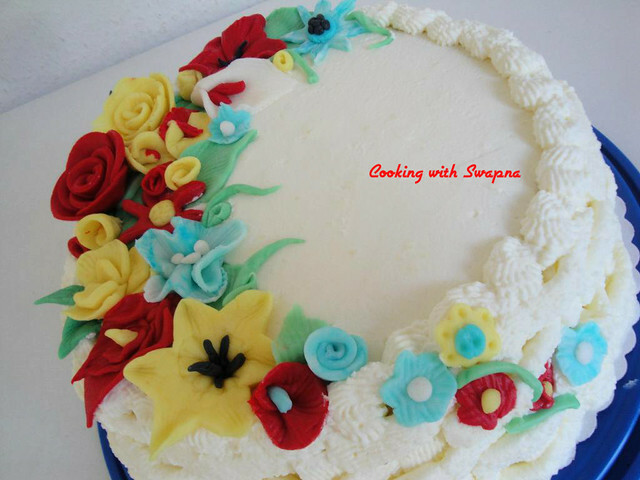 Cool the cake completely and decorate it with the whipped cream frosting. I used the leftover Bhujne to make this delicious Malvani burger. 1. Remove whole spice and bay leaf from the bhujne. 2. Mix in rawa, chickpea flour, rice flour. 3. Add salt to taste. Though the bhujne already has salt, you may need some more to adjust for the flours addition. 4. Make 10-12 balls and flatten them to disc shapes. 5. Heat a pan,tawa or griddle. 6. Pan fry/shallow fry till the patties are brown on both the sides. 7. Serve as an accompaniement with a typical GSB meal or serve as a lobster sandwich. My mom's Methichi bhaaji is exactly similar to VaLutlya Methichi bhaaji. However, since there is a difference between the flavor and texture of two fenugreek vegetables, the result has a different taste. 2. Heat oil in a kadhai. Add the tempering ingredients. 3. As the onion gets soft and potato is cooked, add chopped fenugreek leaves. 4. Sprinkle some water. Cover with a lid. Pour some water on top of the lid. 5. Let it cook on medium heat. 6. Add salt after the greens are cooked. Add a pinch of sugar. 7. 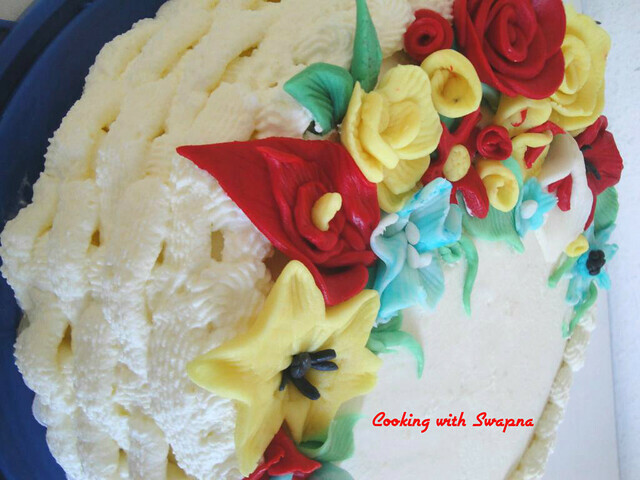 Garnish with fresh coconut. 1. Always add salt after the greens are cooked. Generally after cooking, the greens get wilted and result in very small amount. 2. Mom says it's okay not to add mustard seeds in this recipe as well. In that case first add onion and green chilies and then add turmeric powder in the tempering. Stir for few minutes and then add the potato.